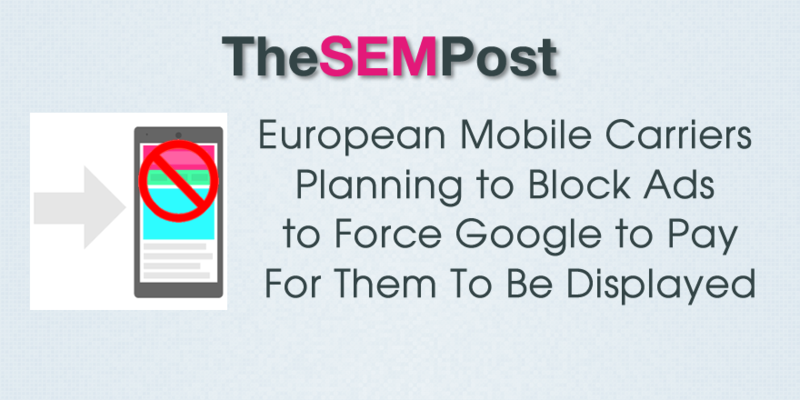 European mobile networks are declaring their own war on Google’s ad revenue by considering the use of the ad blocker Shine across their datacenters, which would block ads from being served to all their mobile customers. They do plan to allow ads to continue to be displayed in social networks, including both Facebook and Twitter, while disabling ads from being served on web pages and apps. This, of course, would have a significant impact on Google’s mobile ad revenue in the EU. Shine won’t reveal which companies they are working with but described one as having almost 40 million subscribers and that there are multiple companies who are working together and will begin blocking ads later this year. While it will initially be a free opt-in service for customers, they are considering unleashing it across all subscribers at the same time. The real target of this seems to be Google, and to force them to pay a portion of their revenue in order to have the blocking lifted. They plan for the ad block to force Google’s hand to negotiate sharing ad revenue with the mobile networks, revenue that many would argue does not belong to them. But do mobile carriers even deserve a cut of the ad revenue? Yes, they do technically serve the ads, but their customers are also paying them already for the bandwidth. And there will definitely be backlash from many companies within the EU and worldwide. After all, many rely on online advertising for their marketing efforts and they likely won’t be happy with mobile carriers effectively holding those online ads hostage. With net neutrality in both the US and the EU, it would not permit companies to block specific types of data – in this case advertising – since they must treat all traffic the same, regardless of its destination or usage. But they feel the risk would be worth the potential financial rewards from the cut of the ad revenue they could take from Google. From Google’s perspective, they feel that ad revenue offsets the cost of the sites, apps, and videos that many users access. And if ads are to be blocked at a carrier level, it would hurt webmasters of individual websites and apps too since they would also be losing a significant portion of the revenue with ads being blocked. With many of them reliant on advertising revenue, this could have a serious impact on some to keep even operating those sites. In 2013, Free, an ISP in France blocked advertising with an update to their routers, but the government forced them to remove the block within a week. Similarly, some US ISPs have also tried to inject their own ads on third party content, replacing other ads on the page, again a move that was reverted after consumer outcry. If the mobile carriers do implement ad blocking, it will be very interesting to watch and see how it plays out and how quickly the government will become involved in the situation. But with the carriers providing advanced notice on their planned move, the EU could step in before Shine is ever implemented.